O God, who called the Bishop Saint Irenaeus to confirm true doctrine and the peace of the Church, grant, we pray, through his intercession, that, being renewed in faith and charity, we may always be intent on fostering unity and concord. Through our Lord Jesus Christ, your Son, who lives and reigns with you in the unity of the Holy Spirit, one God, for ever and ever. St. Irenaeus was born in Asia Minor around the year 140. It is not known when he came to Gaul. He was a priest of the Church of Lyons during the persecution of 177 when St. Pothinus, first bishop of the city and the first martyr of Lyons, was put to death. Irenaeus succeeded him as bishop and twenty-five years later was martyred in his turn during a fresh persecution. At a time when Gnostic sects threatened to undermine Christianity by a perversion of Christian thought, St. Irenaeus vigorously denounced all heresies and safeguarded unity of belief by laying down the principles of the doctrinal tradition of the Church. According to the 1962 Missal of St. John XXIII the Extraordinary Form of the Roman Rite, today is the Vigil of Sts. Peter and Paul. St. Irenaeus' feast is celebrated on July 3 in this form of the Roman Rite. For both the Extraordinary and Ordinary Forms, tomorrow is a solemnity, and so observance of Saints Peter and Paul begins with Evening Prayer I in the Liturgy of the Hours this evening and observed with a special vigil Mass. The liturgical day is from midnight to midnight in the Church's observance, except for Sunday and solemnities which begin with the evening of the preceding day. 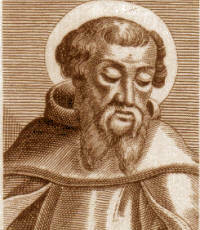 Saint Irenaeus was born in the year 120; he was of the Greek tongue, and probably a native of Asia Minor. His parents, who were Christians, placed him while still young under the care of the great Saint Polycarp, Bishop of Smyrna. It was in this holy school that he learned the sacred science which later made him a great ornament of the Church and the terror of her enemies. Saint Polycarp cultivated his rising genius and formed his mind to piety by his precepts and example, and the zealous young scholar was careful to reap all advantages offered him by the solicitude of such a master. Such was his veneration for his tutor’s sanctity that he observed all the acts and virtues he saw in that holy man, the better to copy his example and learn his spirit. He listened to his instructions with an insatiable ardor, and so deeply did he engrave them in his heart that the impressions remained vivid even in his old age. In order to confound the heresies of his age, this Doctor of the Church acquainted himself with the conceits of the pagan philosophers, and thereby became qualified to trace every error to its sources and set it in its full light. By his writings he was already known to Tertullian, Theodoret and Saint Epiphanus, who speak of him as a luminous torch of truth in the darkness of those times. After Irenaeus had spent a number of years in combat against the eastern gnostics and philosophers of error, Saint Polycarp determined to send him to Gaul, where many of the heretics of Asia Minor had already migrated to pursue the Catholic religion, which was beginning to find roots there. With a company of about forty Christians, the valiant soldier of Christ ascended the Rhone to Lyons to rejoin and aid Saint Pothinus, its bishop. Saint Pothinus was already advanced in age, and his church’s neophytes could not always distinguish truth from the gnostic aberrations. Saint Pothinus received the apostles with joy and soon ordained Saint Irenaeus. A hundred times he exposed himself to martyrdom by his zeal, acting as the right arm of the aging bishop, but God was reserving that crown for him twenty-five years later. When Saint Pothinus had glorified God by his splendid martyr’s death in the year 177, Ireneus was chosen to be the second bishop of Lyons. The persecutors imagined that Christianity had been stifled in Lyons, and they ceased their pursuits for a time. This great Doctor of the Church wrote many important works, of which the most famous is his Adversus Haereses, Against the Heresies, in explanation of the Faith. By his preaching, Saint Irenaeus in a short time converted almost the whole country to the Faith; the Christians of Lyons became models by their candor, their estrangement from all ambition, their poverty, chastity and temperance, and in this way confounded many adversaries of their religion. Saint Irenaeus continued to imitate what he had seen done by his beloved master, Saint Polycarp, himself the disciple and imitator of Saint John the Apostle. One can readily imagine the excellence of the administration and the breadth of charity reigning in the Church of Lyons. Finally he suffered martyrdom there, with many others, in the year 202, under the Emperor Septimus Severus, after eighty years spent in the service of the Lord. The imperial decrees renewing the persecutions arrived at Lyons at the time of the celebration of Severus’ tenth year of reign; the pagans found amid the celebrations an opportunity to take vengeance on the Christians, who refused to participate in the debaucheries which accompanied these feastings. Assassins armed with daggers, stones and knives filled the city with blood, and thousands of Christians won, with their bishop, the crown they had always admired as the greatest glory God could grant His servants. Excerpted from Little Pictorial Lives of the Saints, a compilation based on Butler’s Lives of the Saints, and other sources by John Gilmary Shea (Benziger Brothers: New York, 1894); Les Petits Bollandistes: Vies des Saints, by Msgr. Paul Guérin (Bloud et Barral: Paris, 1882), Vol. 7. Patron: Archdiocese of Mobile, Alabama. St. Irenaeus of Lyons wrote extensively. You can read some of his writings, his most famous writing being Against the Heresies. St. Irenaeus was a great defender of the Faith. Spend some time today learning more about the teachings of the Church. Dave Armstrong is an excellent apologist and you could start with his Church Fathers page.